District Development Commissioner Dr. Shahid Iqbal Choudhary chaired District Level Review Committee (DLRC) meeting of Lead Bank Office Srinagar on Wednesday to review the progress of banks during the third quarter of 2018-19 fiscal. 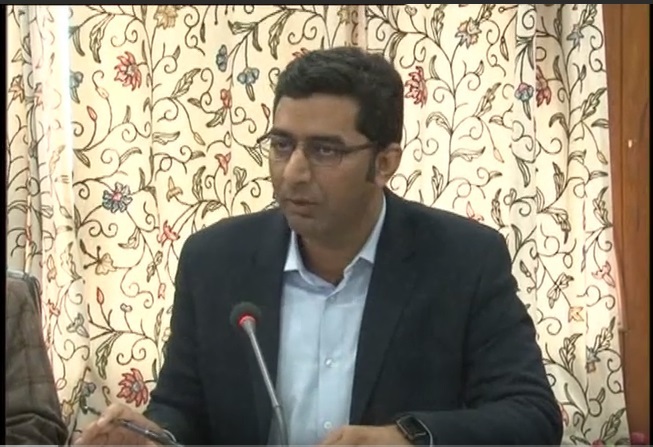 Banks in Srinagar are going to contribute towards development and upkeep of important roads in the district under Corporate Social Responsibility, he informed. The banks in the district have been instructed to play their role as identified under CSR and direct the fixed percentage of profits towards the development of the district as mandated upon them under the Companies Acts. The meeting was informed that under the District Credit Plan 2018-19 amounts of Rs. 1315 crore and Rs. 2010 crore have been disbursed under various schemes in the priority sector and the non-priority sector respectively by the end of the third quarter of the 2018-19 fiscal. It was informed that the total disbursements at the end of this third quarter in the district amount to Rs. 3325 at 55% achievement. It was also informed that the Credit Deposit Ratio (CDR) in the district at the end of quarter ending 31 December 2018 stands at 53%, adding the total deposits and advances by the end of the quarter include 21,970 and 11,594 crore respectively. The DDC emphasised that banks must be positive and instrumental in credit dispensation and increase the CDR to the benchmark level fixed by the RBI. He called on all banks to increase lending under all sectors in the district. The meeting also reviewed the progress and achievements of banks in the implementation of various government-sponsored schemes. The DDC asked all banks to ensure concerned departments are taken on board and seek their assistance for facilitation of cases. The DDC also asked all the banks to conduct regular awareness programmes and submit details to his office. He said banks and various financial institutions in the district must play their due role for the economic progress of the district. Dr Shahid launched the NABARD’s Potential Linked Credit Plan for the 2019-20 fiscal on the occasion. The PLCP 2019-20 for the district amounts to Rs. 4017 crore under various sectors. LDM Srinagar, DDM NABARD, RBI representative, cluster heads of banks and financial institutions operating in the district, and representatives of various government departments attended the meeting.